In November 2011, I wrote the text for the website of Oscar’s Table, a new Asian-inspired restaurant in the Melbourne Docklands area. The website was launched in December 2011. To prepare to write the text, I spoke with the two co-owners of the restaurant, and I interviewed the chef, the restaurant manager, and a member of the waitstaff. I also sampled a few of the chef’s favorite dishes, so I could write knowledgeably about the food the restaurant served. I wanted to be well-versed in the website practices of the restaurant industry, so I also examined the sites of some of the restaurant’s competitors and those from similar restaurants in other parts of Australia and around the world. After finishing my research, I crafted text for the restaurant’s initial 10 website pages: Home, Long Table, Dining, Menu, Breakfast, Lunch, Dinner, Wine, Functions, and Contact, following Oxford Style guidelines. 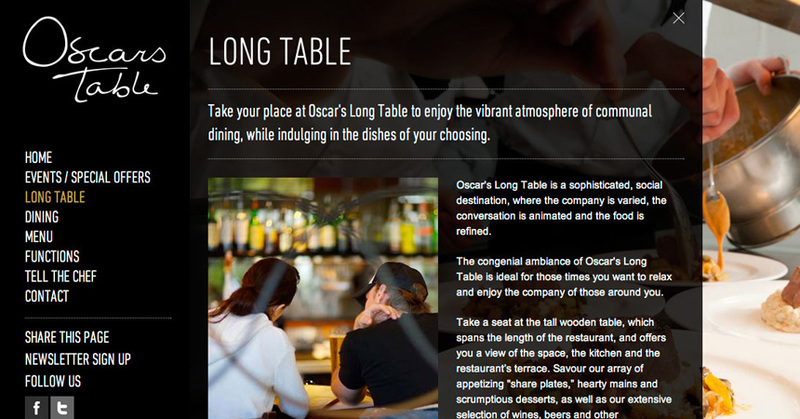 I provided the staff at Oscar’s Table with one round of edits to the text, and once I finalized the text and received their approval for the content, I placed the text (and the images the restaurant provided) into the Blocks content management system (CMS). Although the website has changed somewhat since its initial launch, you can still read much of my original content on the Oscar’s Table website.